Before I get too far with this post, I do have to say that this particular entry is part of a “blog train”, featuring mostly fellow writers from the Stonecoast MFA program – from which I graduated. It’s really a brilliant idea, suggested by my friend J.R. Dawson (I’ll link you up to her blog later, as part of the ‘train’) and it’s a way to help promote fellow bloggers and writers. If you like any of my stuff, you may want to check out some of their blogs as well, since we all pretty much learned our craft from the same set of people. Hello. My name is Joseph Adam Carro, and I’m a writer. I even have a BFA and an MFA I can back that up with, if needed. (No, seriously…want to see?) I received my BFA from Saint Joseph’s College of Maine, Standish and then ten whole years later I received my MFA from the Stonecoast MFA program, through the University of Southern Maine. I work currently as a barista at a major coffee chain, and in my free time I wear many different hats. I’m a gamer, through and through. I’m addicted to The Last Of Us for PS3 (the story is so amazing and the multiplayer is the most balanced I’ve ever seen) and I’m currently re-playing Lord Of The Rings: War In The North. Chrono Trigger is probably my favorite video game of all time, and I’m currently playing through the DS version for the second time. (If you want to see a blog post I wrote about Chrono Trigger you can check it out HERE and then if you want to, on UPENDER where it was also published). I’m not just into video games, though…I also play Magic: The Gathering, Dungeons & Dragons, Descent, Munchkin, Legendary, Hero Clix, DC Deckbuilding Game, and more. I am a game fiend. Show me a game and I’ll play it. 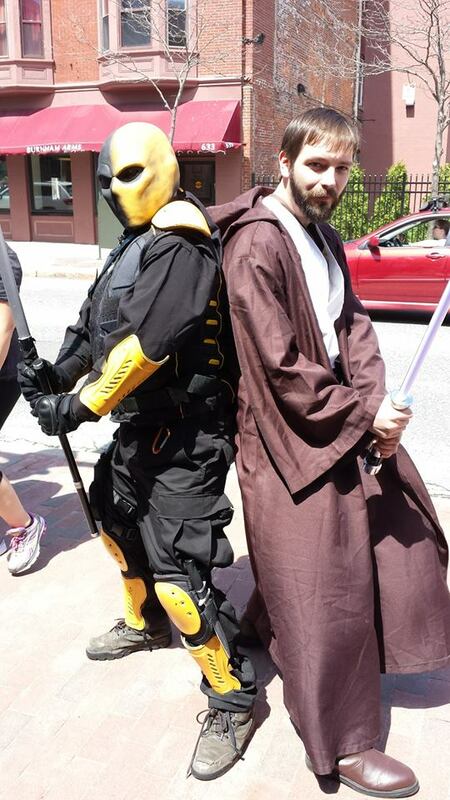 My friend Matt on the left as Slade Wilson, and me on the right as Obi-Wan Kenobi. Cosplaying is a big hobby of mine. I cosplay mostly as Obi-Wan Kenobi from Star Wars: Episode III, but I also like to cosplay as Abraham Lincoln: Vampire Hunter and Jareth from Labyrinth. I’ve made a lot of friends cosplaying, and I just love doing it. I have interviewed many friends in a blog segment I call Cosplay Confessions, which you can see an example of HERE. 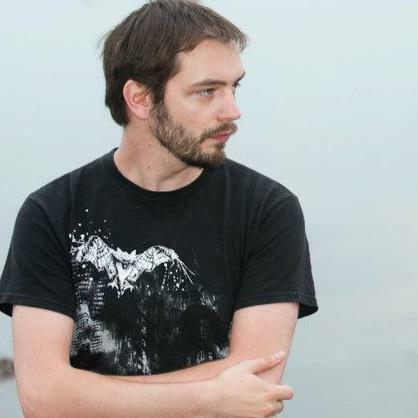 I also love to dance, I have a YouTube channel where I post lip-sync videos (and I even starred in a short film which won first place in the International Mustache Film Festival), I am a ghost hunter/paranormal investigator, I dabble in music and can sort of play the keyboard by ear (and was once in a band). I am somewhat of an artist and photographer, a history and movie buff, and I of course love to read and write. Some of my favorite authors include Stephen King, Chuck Pahlaniuk, Terry Brooks, Carl Hiaasen, J.K. Rowling, and Dean Koontz (although there are plenty more). I’m not super into sports, although I do like watching hockey. I love hiking mountains and swimming and sometimes even going for a run. So as you can imagine…with all these activities and hobbies, it’s kind of hard for me to find time to write. Yet, here I am, with this blog I try to update as often as I can. It’s a place for me to put my thoughts out into the æther, to share my love of various things, to proclaim my excitement…to tell stories. Stories are what vitalize me and I try to tell them as often as I can, whether it’s in an online format such as this one, or a screenplay, or a short story, or even the YA novel I’m working on. Stonecoast is where I earned my MFA, and Stonecoast is what still gives me inspiration, and the proverbial footing, to keep doing this. Some of my best friends are people I met during my two years with the program, and I do believe most or all of those friendships will last quite a long time. It’s a place that fosters community, creativity, the passion for the craft. The faculty is top-notch and even though I’ve already graduated, they still keep in touch and sometimes even help with pep talks and advice even though they are extremely busy people. I had the pleasure of working under Dolen-Perkins Valdez (Wench, Balm), Michael Kimball (Undone), and Nancy Holder (Wicked series) directly, as they were my mentors throughout my time with Stonecoast. But I was also able to work with talented authors such as Theodora Goss (In The Forest Of Forgetting), James Patrick Kelly (Burn), Elizabeth Hand (Generation Loss), Elizabeth Searle (Girl Held In Home), David Anthony Durham (Acacia trilogy), and Suzanne Strempek Shea (Selling The Lite Of Heaven). These amazing mentors and teachers have helped me to hone my skills to what they have now become, and I’m anxious to show them what I can pull off in the future. As far as my talented friends go, I have many of them – not just from Stonecoast but from all walks of life. One in particular, though, needs mentioning now as part of the Blog Train we’re on – and her name is J.R. Dawson. J is one of the nicest, most enthusiastic writers and bloggers I have the pleasure to know. From what I know of her, and from what I’ve seen/read/heard, she writes mostly steampunk and fantasy/sci-fi and her writing is amazing. During her first semester, I witnessed a reading she gave and I was very impressed. She and I connected on the steampunk genre and have been friends ever since. I’ve enjoyed following her blog posts and writing for some time now, and now you can too. Thanks for jumping on the Blog Train with me, and I hope you come back and read my blog posts more often. Until next time! OMG, I love Chrono Trigger. My old SNES cartridge had a save file that was had at least 5 or 6 new game plus playthroughs on it. Strong characters, great story, fun gameplay, and the music! Some of the best VG music ever. I will need to read your ode to Chrono Trigger soon.